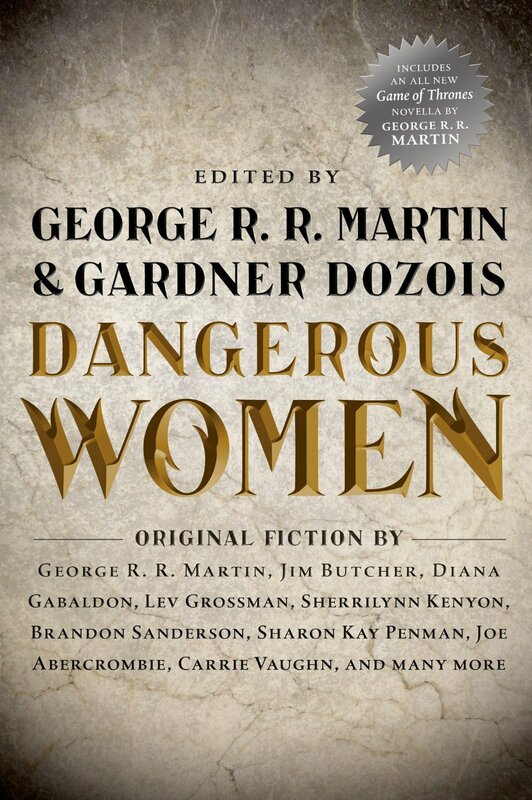 Above is the cover for what to me is the most anticipated super-anthology of the year, Dangerous Women. I've already mentioned all the contributors, but seeing many of them listed there does give me goosebumps. Especially knowing how many of these will connect to the novel worlds of many of the writers. While I do like the general look, it looks a bit just too that--general, but then again so was Warrirors which this is a companion volume to. Maybe Tor was concerned with ending up with a chain mail bikini girl so they went safe. Still I would have thought this would have been a good opportunity to show a strong, dangerous woman on a Fantasy cover with out the awkward poses or unrealistic accouterments. 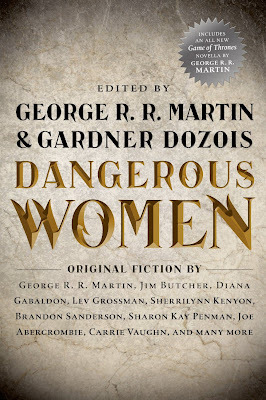 Dangerous Women will be out in early December. Get your Christmas lists ready. Lot of good books have made it into the house. So many that I had to donate 4 bags of books to my local library this weekend. I'm sadly at the point where I have to make tough decisions every month about what books to keep, both old and new just to keep up with the flow. It is in a way a nice problem to have since when I was young I barely had any books to call my own that weren't school related. I was a library hound for many years so it is wonderful to have an amazing selection at hand. Anyway on with the new. Rather than discuss each book I'm just going to point out the ones I'm likely to read sooner than later. Also, if it is pictured here, but not mentioned don't take that as me not being interested. I want to read them I just know it won't be any time soon. Books I receive that I'm not very interested in go in the donation pile and don't get pictured. The first 8 above are buys starting with the much lauded The Dog Stars by Peter Heller followed by the Demon Cycle mini-collection The Great Bazaar and Brayan's Gold by Peter V. Brett. The Brett collection is a UK only release, but the stories are available as eBooks readily in the US. Starslip Crisis Vol 1. I picked up signed by Kris Straub at PAX East this year. While at the comic shop I nabbed Manhattan Projects Vol 2. and Elric: The Balance Lost Vol 3. You is the sophomore novel from Austin Grossman, which is his love letter to video games and the people who make them. The above are all review copies. Carniepunk started as a joke online that quickly tumbled into a full-blown theme anthology anchored by Urban Fantasy stars Kevin Hearne, Seanan McGuire, and Rachel Caine. The Rithmatist by Brandon Sanderson is one I've been looking forward to for a couple years now and is his YA debut. Two Serpents Rise is Max Gladstone's sequel to Three Parts Dead, which was one of my favorite debuts last year. Red Planet Blues is Robert J. Sawyer's detective noir on Mars. Max Barry's Lexicon will be read quite soon as well Zachary Jernigan's debut No Return. The Thousand Names by Django Wexler's debut and another read soon, but not officially out until June. I wasn't aware of Jeff Noon before I received these UK review copies, but his books sound too bonkers to pass by. Ari Marmell is the first to take on the Iron Kingdoms setting in novel form with In Thunder Forged. Iron Kingdoms is an RPG setting I've been interested in for a while as it combines magic and machines and epic battles. That's a recipe for fun. I just finished reading The Great Bazaar by Peter Brett which was a nice treat and I'm now making my way through Iain M. Banks' Consider Phlebas, which is my firs Culture novel. So far it is slower and more brutal than I thought it would be, but it contains one of the best Prologue's in Space Opera I've ever read.